Before Friday night, neither did I.
I’m not making claims that the playwright Bruce Graham is up there up with Eugene O’Neill (although Funnyman is not too shabby), but Wendt’s somber, pained, unstinting turn in this play reminded me of nothing so much as what Nathan Lane was trying to do in The Iceman Cometh. 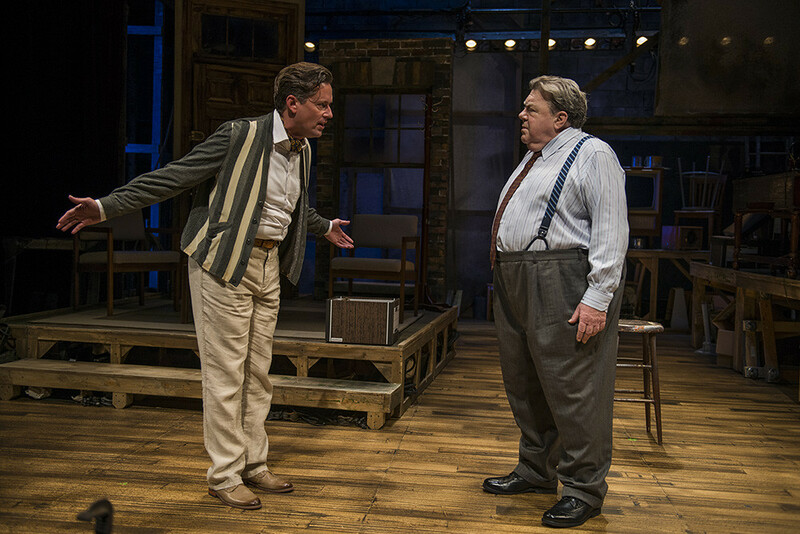 As Wendt’s character, Chick Sherman, notes in the play: “Nobody takes comics seriously until they do something serious.” Great comics come to see that. Wendt is doing something serious here, all right. Graham has given him plenty of fodder for an actor with his particular trajectory: Chick, a consummate craftsman, now has to deal with shoddy new material; irritating, over-educated young directors with no respect for the old-school craft; and, well, the ghosts of a long career in show business and all the sacrifices that has engendered, and all the bad personal decisions it tempted. Sherman’s old catchphrase – and the noose around his neck now – is “Wowza!” “People stop me on the street all the time,” he growls. “‘Say something funny! '” We all have a Wowza! – the one thing that people think we do and that we’re sick of doing. Perchance Norm is Wendt’s “Wowza!” He keeps on giving. Cheers! 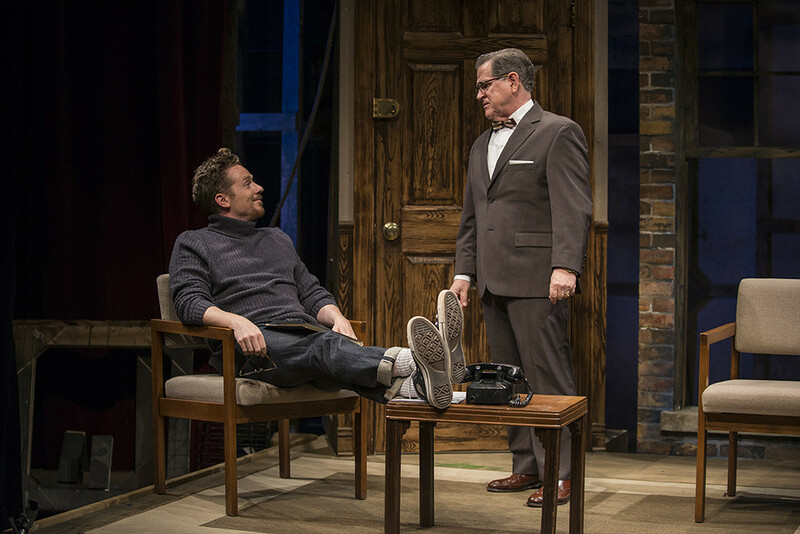 Playwright Bruce Graham knows it and uses one to great effect in his solid new dramedy Funnyman, which premiered to a chorus of belly laughs from Northlight Theatre’s near capacity audience. 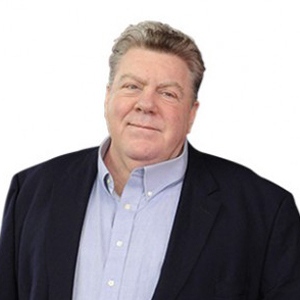 I won’t spoil the scene, except to say it involves Emmy-nominated George Wendt as you’ve never seen him before. And in more ways than one. Funnyman fulfills the promise of its title, particularly with the “inside” show biz bits. 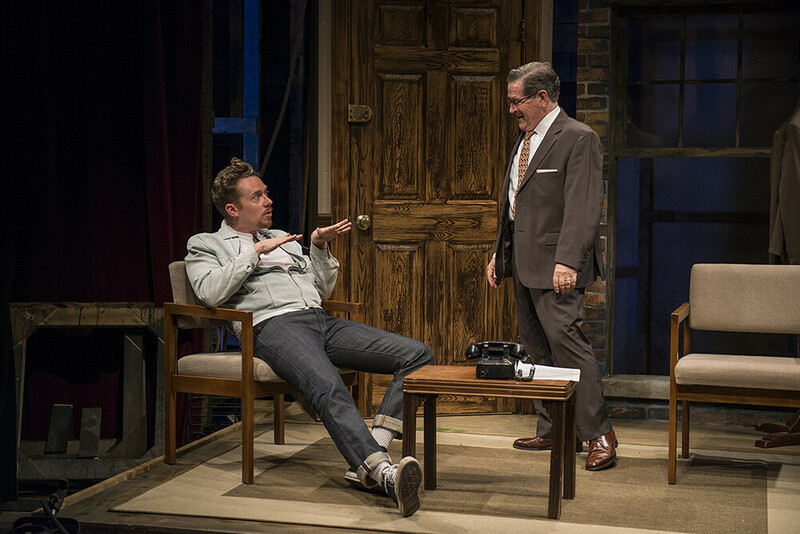 The performances are solid (Second City veterans Wendt and Kazurinsky have great chemistry) and the play benefits from the quietly assured, unfussy direction of BJ Jones, who has helmed four previous Graham commissions for Northlight. Jones knows Graham and he knows comic actors. That’s true of Wendt, who reveals the ache in the soul of a man who arms himself with shtick so he doesn’t have to feel. His deeply felt portrayal suggests an actor who possesses greater weapons than he has so far displayed. Here’s hoping we get to see them again. 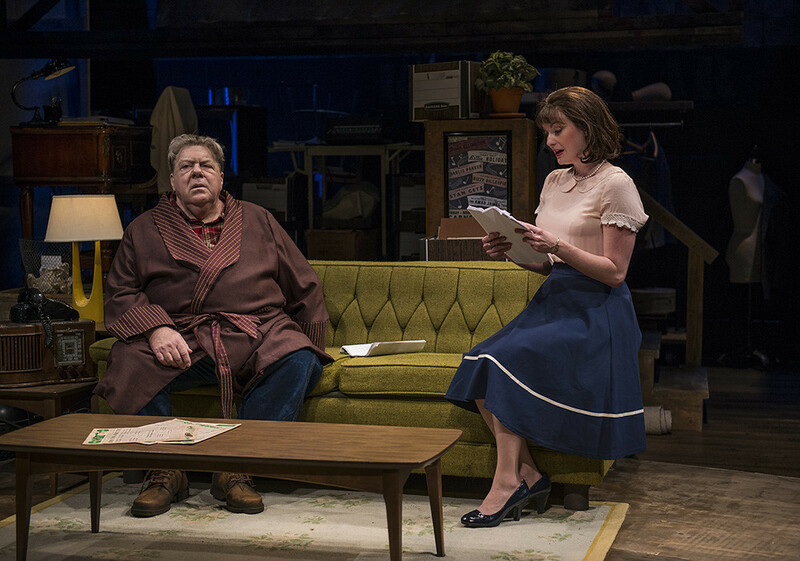 I suppose people seeing the name George Wendt on the billboard for a play titled Funnyman will enter the theater ready to hear the old familiar “Norm” called out as the lights come up. After all, most people know him for the role he created on Cheers all those years ago. 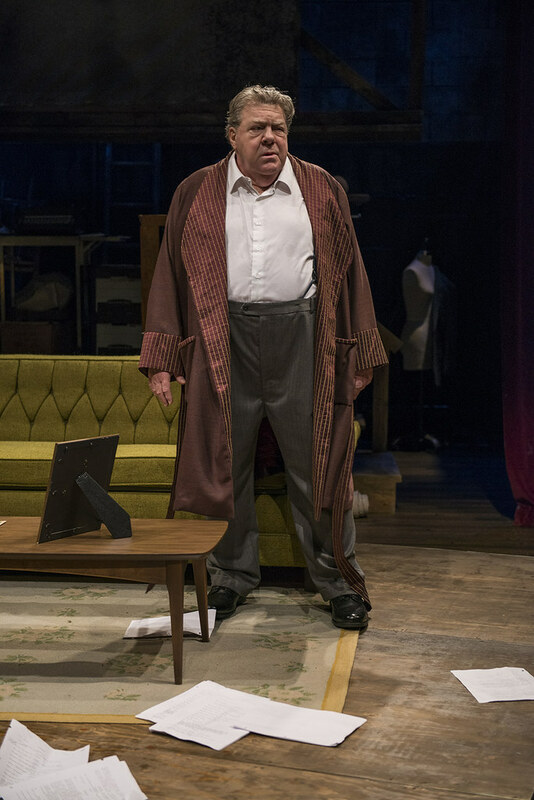 Ladies and gentlemen, please be advised that Mr. Wendt is indeed an actor and can play many roles, which he more than proves in this beautiful story about a fading vaudeville comic who many only remember from his signature “Wowza”! 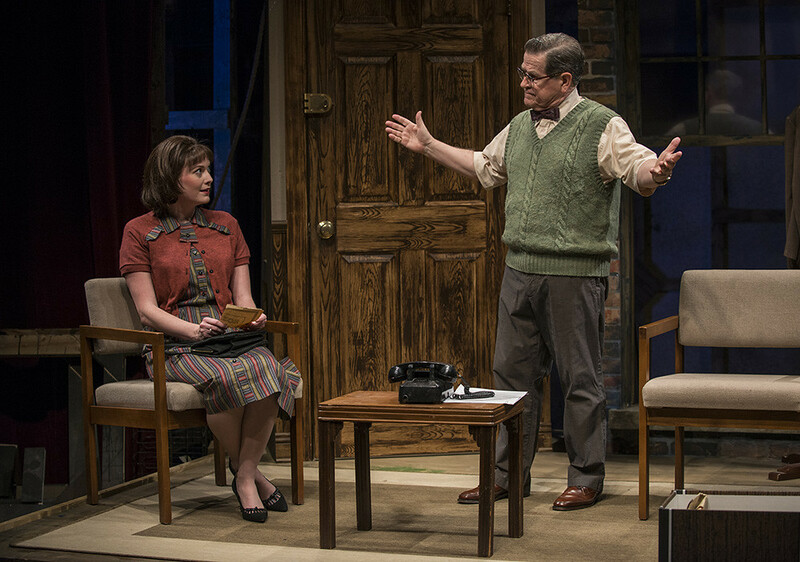 Could this tight story written by Bruce Graham, now on the stage at Northlight Theatre, in reality be “his own story”? Going into this play, try to think about the differences between clown, comedian and comic. While all are on the stage to make us laugh, it is a fine line between what they do. The comedian tells us stories and does bits that have a punchline, the clown does silly things that are out of reality and the comic does more with sight gags and perhaps a trademark. Chick was known for his pants dropping sight gags and his “Wowza”. Fans loved him (or hated him), but none could get close enough to know that deep down, he was a different persona than they saw on the stage. 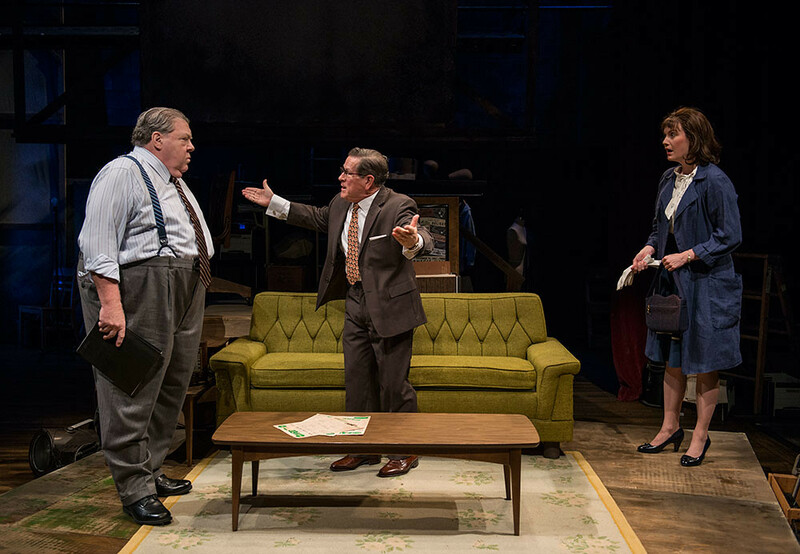 I was impressed with the set (Jeffrey D Kmiec) that allowed us to go between Chick’s home, Katherine’s workplace, Junior’s office and the small Off Broadway theater swiftly. The sound (Andrew Hansen), Lighting (Jesse Klug), projection design (Stephen Mazurek) and props( Kurtis Boetcher) completed the picture that Jones and Graham placed before us. It is a beautiful story, well written and directed to perfection with a dynamite cast telling a story that will take your breath away, and possibly bring a tear to your eye. The life of a comic is often taken for granted. People “assume” their lives are wonderful and they laugh all the time. The truth is, they are private and often sad people who have the desire to compensate for their own lives by bringing laughter to others.. I suggest that you put this one on the see list! 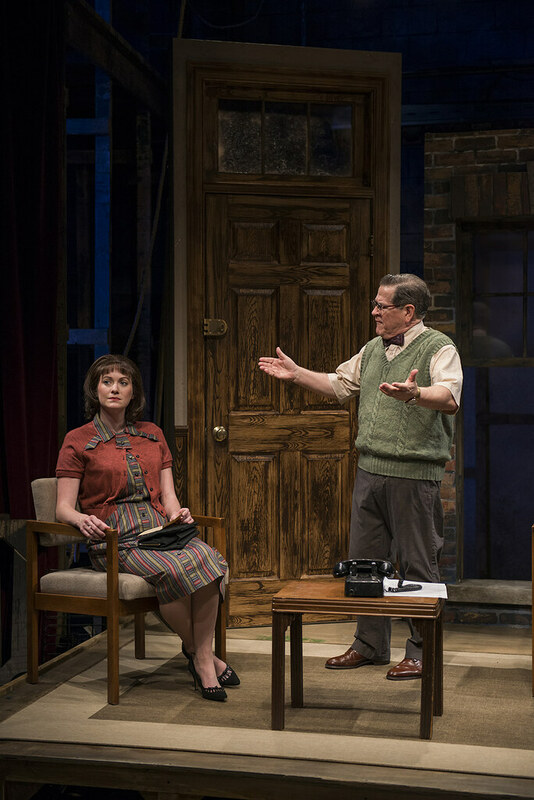 Bruce Graham’s latest play, following the Northlight hit productions of his Stella & Lou, The Outgoing Tide and the recent White Guy on the Bus, understands how to craft a drama with just enough laughs to keep the story from turning depressing. 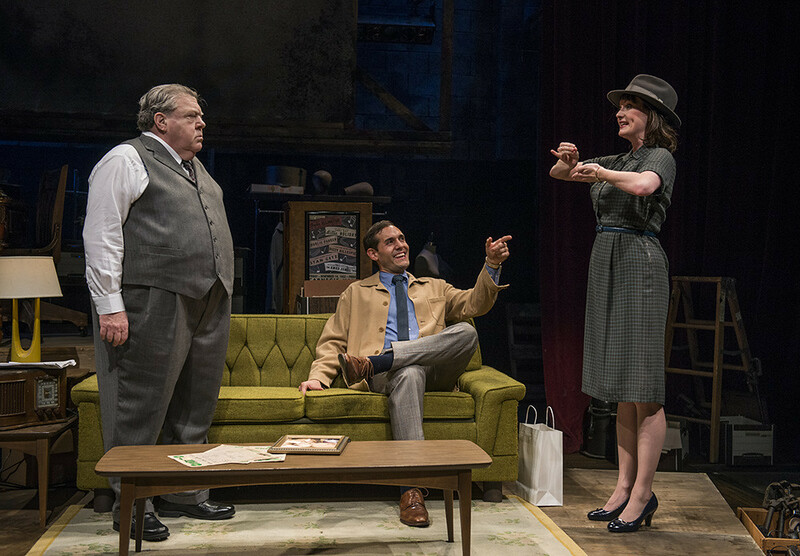 With its modest running time of just under two hours, Graham’s new play gets right to the point without a lot of exposition. 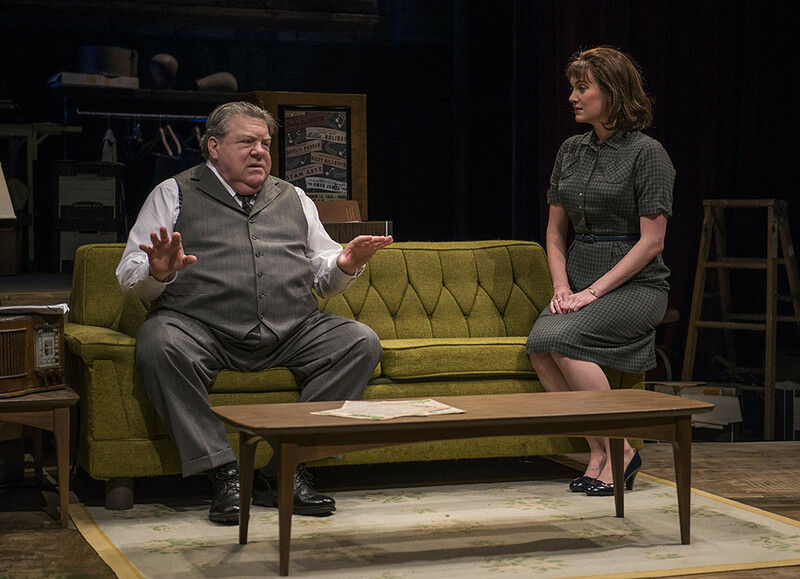 Mr. Wendt’s portrayal of Chick Sherman offers a well of deep, unexpected emotion. Chick’s called “the saddest man I’ve ever met,” by one of the characters, and this sorrow is carefully underplayed by Wendt with skill. 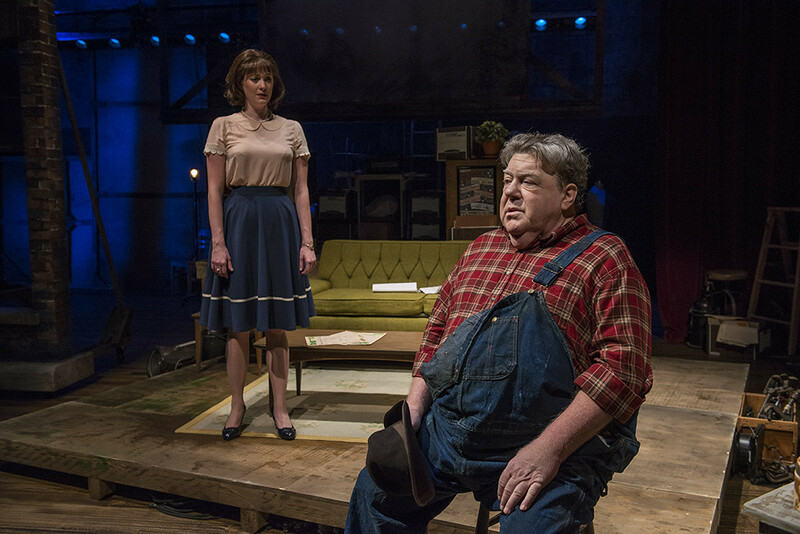 Supported by both his manager and an alcoholic playwright, Mr. Wendt’s sad clown blossoms and discovers once again what it means to feel. The actor’s relationship with his daughter evolves into a wonderful, heartfelt moment that audiences will remember. 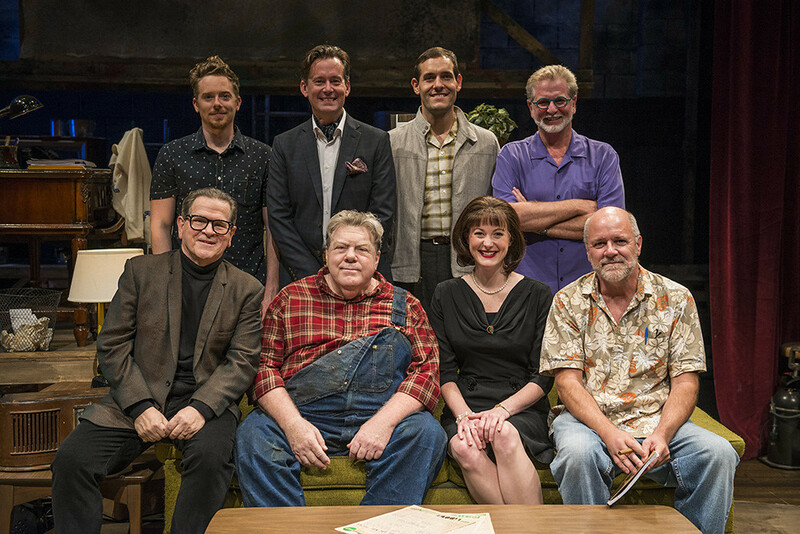 This fine production is staged by BJ Jones with care and compassion, allowing his six experienced actors to live naturally through Bruce Graham’s well-scripted characters. 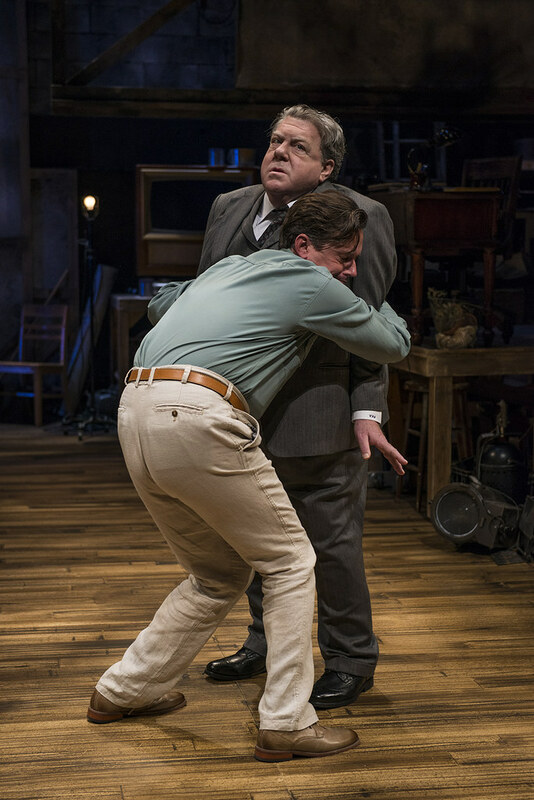 Mr. Jones has gently tapped into the comedy while still bringing the play’s tender, affecting sentiment to the forefront. 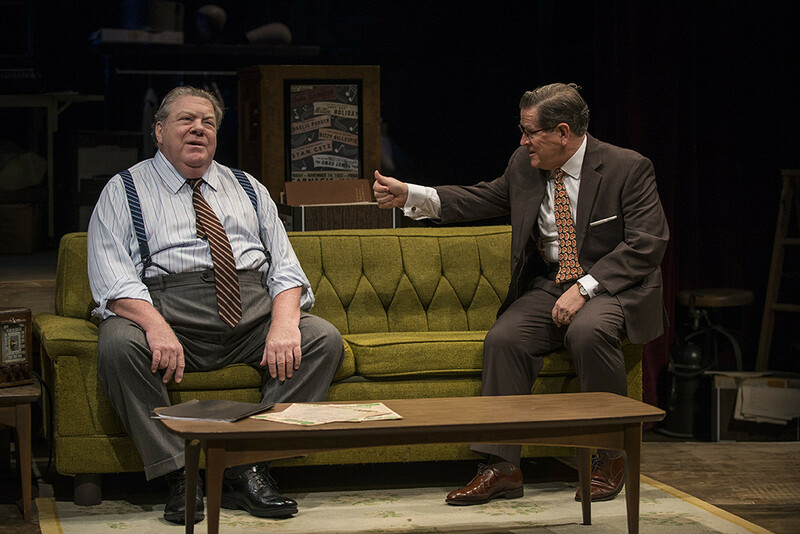 This production is a theatrical triumph for both George Wendt and Tim Kazurinsky and offers a wonderful opportunity for audiences to enjoy the talents of these two terrific actors, as well as their supporting cast. Amanda returns to Northlight where she previously appeared in White Guy on the Bus and Funnyman. Other Chicago credits include: King Charles III (Chicago Shakespeare); Mary Page Marlowe (Steppenwolf), Venus in Fur and Measure for Measure (Goodman); Dutchman (American Blues); Last Train to Nibroc (Haven Theatre-Jeff Award, Best Actress); Rest (Victory Gardens); Pygmalion (Oak Park Festival); Great Expectations (Strawdog); Pride and Prejudice (Lifeline); hamlet is dead. no gravity, The Skriker, Brand, The Love of the Nightingale, and Pullman, WA (Red Tape); and sixteen shows with The Back Room Shakespeare Project. Regional credits include North Carolina & Michigan Shakespeare Festivals. TV credits: Chicago Med, Bobby & Iza. Film credits: The View From Tall. Ms. Drinkall holds a BFA from the University of Illinois at Urbana-Champaign and is represented by Gray Talent Group. Steve returns to Northlight where he was last seen in Season’s Greetings and She Stoops to Conquer. Recent Chicago credits: Doubt: A Parable (Writers), Accidentally Like a Martyr and The Aliens (A Red Orchid), Tribes (Steppenwolf), Wasteland (Timeline), King Lear (Chicago Shakespeare). 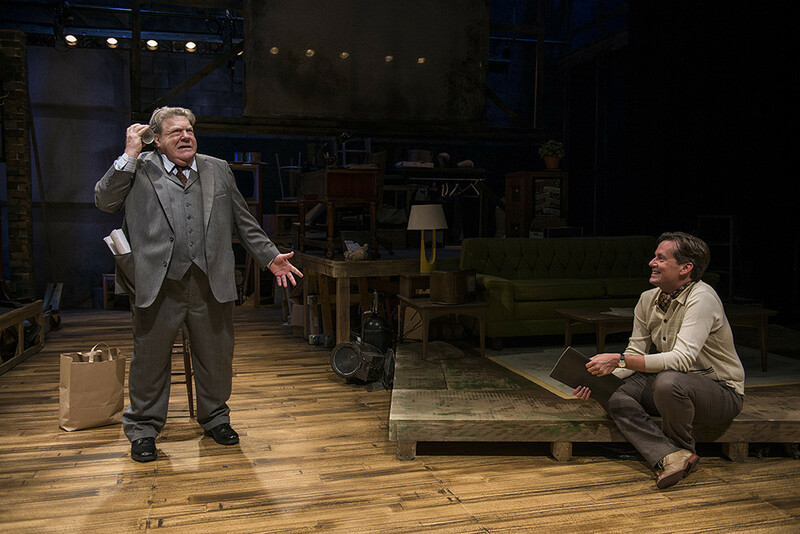 Regional credits: American Players, Milwaukee Repertory and Indiana Repertory. 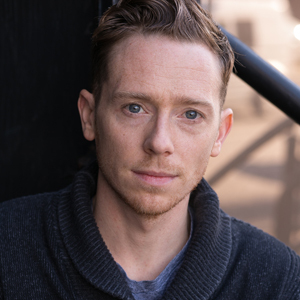 Steve is an ensemble member of A Red Orchid and a graduate of The Theatre School at DePaul University. Rob is making his Northlight debut. 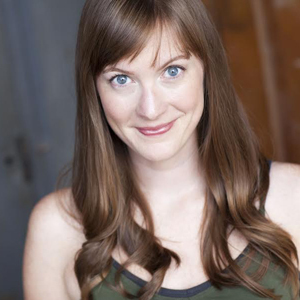 Other acting credits include: The Secret Garden, James Joyce’s “The Dead,“ Angels in America: Parts 1 & 2, Caroline or Change and Carousel (Court);Bach at Liepzing, Oh Coward! (Writers); Candide (Goodman); Wings (Appletree); Urinetown (Mercury); The Most Happy Fella (Ravinia); A New Brain, Sweeney Todd, Closer Than Ever (Porchlight). Directing credits:How to Succeed in Business Without Really Trying, Lady Day at Emerson’s Bar & Grill (Porchlight) and the musical parody 50 Shades! : The Musical, which played around the country and Off-Broadway. Rob won a Jeff Award for his performance in Oh Coward! and his cabaret trio Foiled Again has won an After Dark Award for Outstanding Cabaret Performance. Foiled Again’s album Blanket of Winter is available on iTunes and CDbaby.com. This winter Rob will direct the musical version of Far From Heaven at Porchlight. Michael is a California native who has found an artistic home here in Chicago. Chicago credits include Short Shakes! Macbeth (Chicago Shakespeare), The Liar (Writers), The Foreigner (Provision) and three winters in A Christmas Carol (Goodman). He’s done outdoor Shakespeare with American Players, Montana Shakespeare in the Parks, Door Shakespeare and Riverside Theatre. Michael is a proud stakeholder of the Back Room Shakespeare Project. 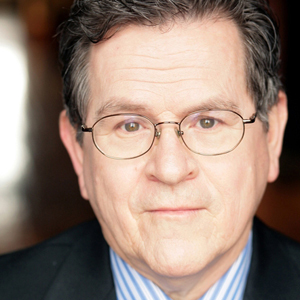 Broadway credits include: Breakfast at Tiffany’s, Elf, Art, Hairspray. London credits: Art. Off-Broadway: An Empty Plate in the Café du Grand Boeuf (Primary Stages), Wild Men (West Side Theatre). National Tour: Twelve Angry Men (Roundabout). Chicago credits: Rounding Third (Northlight), The Second City, Wild Men, Bleacher Bums (Organic). Los Angeles and Edinburgh: Re-Animator the Musical. Oodles of film and television, most recently Clipped from Warner Brothers TV and TBS, and most notably Cheers (six Emmy nominations). Plays: White Guy on the Bus, Stella & Lou, The Outgoing Tide (2011 Jeff Award – Best New Play),Burkie, Early One Evening at the Rainbow Bar & Grille, Moon Over the Brewery, Belmont Avenue Social Club, Desperate Affection,Coyote on a Fence (Winner of The Rosenthal Prize, Two Drama Desk Nominations), According to Goldman, The Philly Fan, Mister Hart and Mister Brown. He has won consecutive Barrymore Awards for Best New Play for Something Intangible and Any Given Monday. Film: Dunston Checks In, Anastasia, Steal This Movie. TV: Roseanne, Ring of Endless Light (Humanitas Award Winner – Best Children’s Screenplay), The Most Wonderful Time of the Year, Trading Christmas. Graham is a past winner of the Princess Grace Foundation Statuette. Along with Michele Volansky, he is the author of the book The Collaborative Playwright. 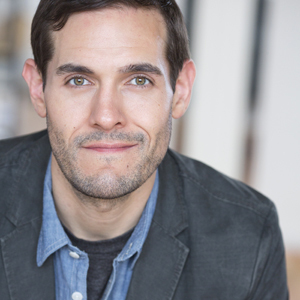 Graham teaches film and theatre courses at Drexel University. He divides his time between South Philly and Elkton, Maryland, with Stephanie. Jeffrey is a Chicago-based scenic designer. 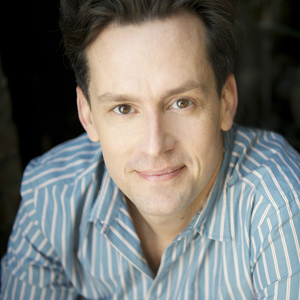 Local credits include: Butler, Funnyman, The Commons of Pensacola and Tom Jones at Northlight Theatre; The Little Mermaid, A Christmas Story and Les Miserables (2015 Jeff Award Recipient) at Paramount Theatre; Crazy For You, Deathtrap (2016 Jeff Award Recipient) and The 25th Annual Putnam County Spelling Bee at Drury Lane Oakbrook; Man of La Mancha at The Marriott Theatre; Lady Day at Emerson’s Bar and Grill, Double Trouble, Ain’t Misbehavin’, Sweeney Todd and Sondheim on Sondheim at Porchlight Music Theatre; Good Boys and True, Dividing the Estate (Jeff Award Nomination), The Old Friends, A Loss of Roses (Jeff Award Nomination) and The Assembled Parties at Raven Theatre; Watch on the Rhine (Jeff Award Nomination) and The Seagull at The Artistic Home. Regional credits include: American Players Theatre, Illinois Shakespeare Festival, Arkansas Shakespeare Theatre, Heritage Theatre Festival and the Children’s Theatre of Charlotte. Jeffrey received his MFA from the University of Virginia. Rita is proud to be the stage manager for Into the Breeches!, her 33rd Northlight production. Other recent projects: The Polar Express train ride, seven seasons of The Christmas Schooner at Mercury Theater, and productions at Victory Gardens, Route 66 Theatre Company, Theatre at the Center, and Northlight’s productions of Chapatti and Stella & Lou in Galway, Ireland. She is the proud wife of actor Tom Hickey and mom to six-year-old Charlie, and has been a member of Actors’ Equity for 18 years. Thank you for supporting live theatre!